Student tells professor he missed seminar to attend funeral. Professor asks for proof. If you don't show up to a seminar and your professor asks you why and the honest answer is "I didn't want to go", it's tempting to lie and say "I had to go to the doctors" or "my bus didn't show up". What you shouldn't do, however, is what Ryan Johnson did. When his professor asked him why he hadn't shown up for a class, he told them "because I was at a funeral". Unfortunately the professor didn't believe him at all and asked for proof. So Ryan Johnson did what any other student would do when they are caught out in a lie. He confessed and asked for forg.... oh no, he didn't. He sat down and forged an order of service. Ryan clearly thinks his professor has never heard of google or music, as he's included speakers such as Tremaine Neverson aka Trey Songz and Dwayne Michael Carter, aka Lil Wayne. 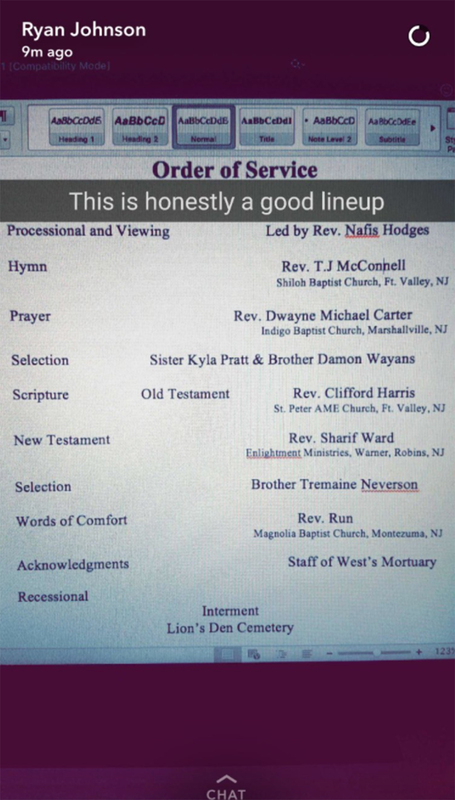 After Ryan's friend tweeted his forged order of service, a lot of people have seen it. But so far there is no word on whether the professor has figured out the con yet. We'll keep you updated.